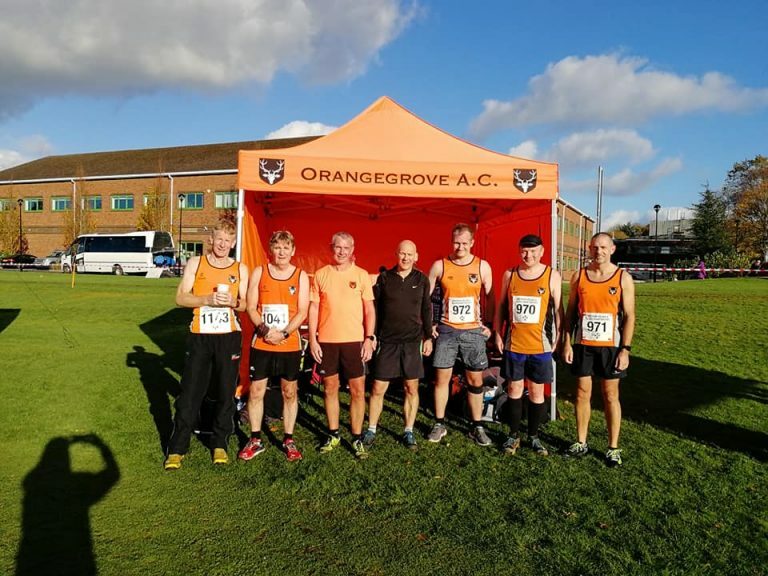 Not one of the busiest weeks of racing for Orangegrove but it’s a major one and been a long time coming around for Michael Broadhead and Jill Long, who chose distance in Dublin over mud in Greenmount, Antrim. The ever-keen and ever-muddy OG crew gathered in CAFRE Greenmount Campus in Antrim for the Bobby Rea XC in which an even, and certainly not odd, number of 8 ladies and 8 men turned up with their spike and trail shoes to perform admirably. 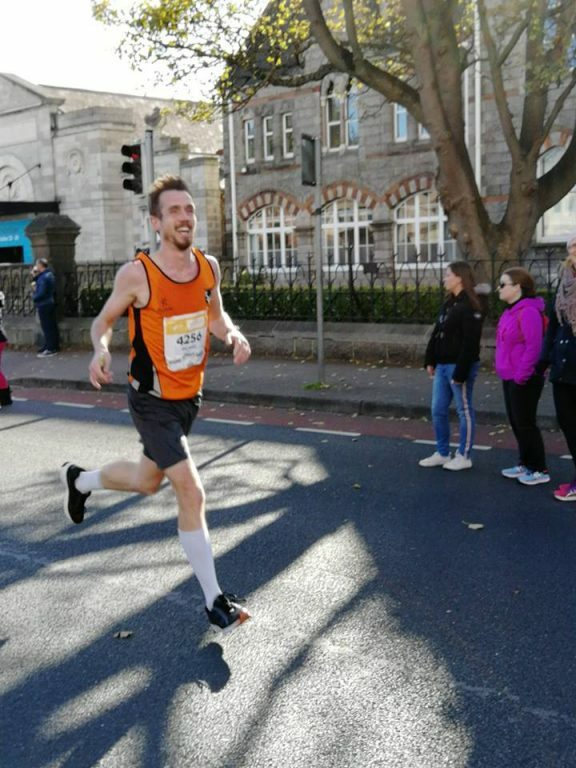 Frank Rea of North Down AC won the 60+ section in 23:59, with Brian Todd finishing 3rd in 26:08 (I hope Brian didn’t strain his legs too much before New York City Marathon – all the best Brian!). 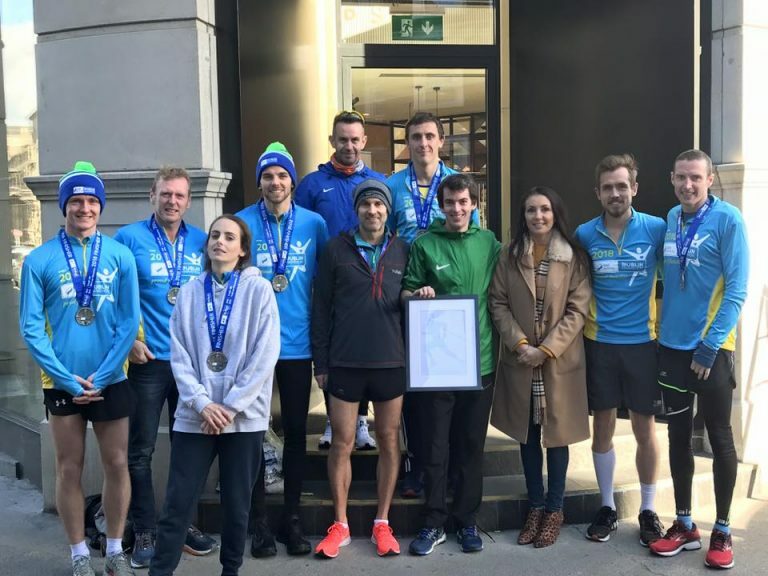 You may be aware that Michael Broadhead was chosen as part of Paul Pollock’s 2018 sub-3 hour attempt at Dublin Marathon. Despite doing well to get chosen, the hard work was yet to come and whilst following an individual athlete’s training programme, as designed by Paul, Michael had to be disciplined and put in the hard miles, whilst also operating smarter (rest vs junk miles). Despite this expert help, experienced guidance and similar company…it doesn’t guarantee a sub-3 hour finish! Jill Long also had a personal journey, having had endured major difficulties in last year’s Dublin Marathon, so, a lot was riding for both and scope for improvement potentially there. I am happy to say that both achieved massive PBs and Michael did not just gain a sub-3 hour finish but smashed it and finished 371st out of 16,360! Absolutely brilliant and a very well done to you both!!! I think the support crew also smashed it (and maybe drinking 26.2 pints of Guinness in record time) so thanks to them for their enthusiastic support. The Dublin City Marathon 2018 was won by Asefa Bekele in 2:13:23, with Mesera Dubiso taking the ladies title in 2:33:48. Mick Clohisey (Raheny Shamrock AC) took gold in the AAI National Marathon Championships in 2:15:58, while Lizzie Lee (Leevale AC) claimed the ladies National title in 2:35:04. Continuing on the #DreamRunDublin18 theme, Paul Pollock, now holds the Male Victoria Parkrun Record by finishing in 14:56! He must have been confident with Michael and crew to chillax and sneak in a wee Parkrun before Dublin! Talking about famous athletic people, Beverley Martin completed her 200th Parkrun – well done Beverley! Stormont Parkrun also had a few stars on show with Pauline Bayliss finishing as 1st lady, Jacob McKittrick finishing 3rd, Gillian Logan and Rodney Corrigan achieving a new Stormont PB. Reg Sanlon similarly scored an Orangefield Parkrun PB, whereas, Ali McConnell received a prize for her 2nd in Age Group achievement. Not so quiet in a quiet week…well done all.